SAL DeTRAGLIA'S VIRTUAL TAPAS BAR: A BRIEF PRIMER ON SANGRÍA. Most sangría is not meant for human consumption. Rather, it is intended as a means to punish British tourists for their nation’s occupation of Gibraltar. The Mexicans have Montezuma’s Revenge; the Spanish have sangría. To understand sangría, we must look at it from two different angles: the theory, and the reality. In theory, sangría is a fruity, moderately sweet, pleasingly alcoholic warm-weather drink. Red wine, citrus, sugar, spice and an extra boost of alcohol are artfully combined, chilled until ice-cold, and served in a goblet. A good sangría should be everything that US-style “wine coolers” promised, but never delivered: a well-balanced drink that is not too sweet, not too spicy, and certainly not watery or fizzy. When made correctly, it’s a tasty foil to Spain’s furnace-like summertime heat. But alas, theory and reality diverge quite radically. The sangría served at many bars and restaurants in Spain and abroad is downright blasphemous. There are countless ways to ruin sangria, but some are more common than others. For starters, many bars and restaurants use – as the base for their sangría – the cheapest wine in their inventory…and thus, the most vile. This is significant, since wine comprises at least 95% of sangría’s content. Some places go a step further, by using the remains of unfinished wine bottles retrieved from tables after the patrons have left. I’m not joking. I’ve witnessed it first-hand. Then comes the fruit element. Often, the sangría served in bars and restaurants resembles a well-moistened fruit salad. At any given moment, I envision a bartender opening a can of DelMonte® Fruit Cocktail and simply dumping its contents into a pitcher of wine. Restraint, gentlemen! Let’s use restraint! If you need to chew it, it’s not a good sangría. If you find yourself reaching for a fork, then trust me…it’s not a good sangría. Then comes the liquid embellishments (not that sangría needs any). I’ve seen bartenders pour champagne, sparkling water, and – most shocking of all – 7-Up® (FOR GOD’S SAKE!) into their alleged sangrías. Can you imagine?! Aside from watering it down, these additions make the sangría fizzy. Gin and tonics should be fizzy; sangría should NOT! Finally, comes the booze-booster. 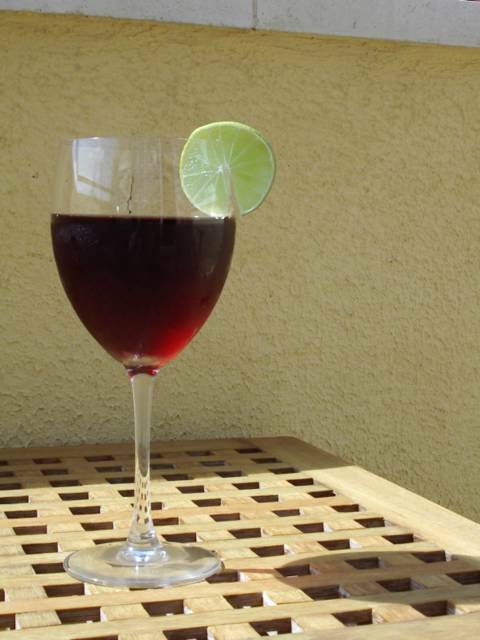 Bars and restaurants may add brandy, cognac, vodka, rum or schnappes to kick-up the alcohol-content of their sangría. It’s not the use of these liquors that I’m opposed to, but rather the quality. A bartender will rarely reach for a top-shelf liquor when perking up his sangría. Instead, he’s more likely to grab a bottle with no label or – worse yet – one with a label bearing the name of his liquor distributor’s daughter. He’ll then attempt to smooth over any harshness by dumping a heaping scoop of sugar into the mix. And that, my friends, is the reality: cheap wine, too much fruit, cheap liquor, and lots of sugar. Is it therefore surprising that typical bar/restaurant sangría is so bloody awful? Methinks not. But here’s the irony: Tourists LOVE the stuff! I see them sitting at outdoor tables – their sun-blistered noses peeling like iguanas beneath corporate-logo’d baseball caps – downing pitcher after pitcher of sangría as if there were no tomorrow. And they would indeed be lucky if there were no tomorrow, because the tomorrow that awaits a sangría binge-drinker usually includes a Defcon-4 hangover. Yet despite my sarcasm, I should make one point clear: I do like sangría. Very much so, in fact. But I like it on my own terms. And “my own terms” means that I make it myself. And so should you; so let me tell you how. The sangría recipe listed below is the one that I use at home. I don’t guarantee that you’ll be hangover-free if you abuse it, but I do promise that the hangover will be well worth it. Step 1: Add orange slices, lemon slices and sugar to a large pitcher. Mash gently with wooden spoon until fruit releases some juice (but is not totally crushed) and sugar dissolves (about 1 minute). Step 2: Stir in orange juice, Triple Sec, cinnamon stick and wine. Step 3: Refrigerate for at least two hours. Re-stir before serving. Thanks, Sal. I'm going to mix up a test batch soon. Yoda!